It's often said at Japanese ski resorts that once the cherry blossoms start blooming in the cities, people stop thinking about skiing. The flowering trees are so much a symbol of spring that everyone forgets that in the mountains there's still plenty of snow. It's a shame, too. In the mountainous regions of the country, and particularly along the Sea of Japan coast, snow may still be falling in mid to late March even as the cherry blossoms emerge elsewhere. In fact, many of the ski areas in Niigata Prefecture enter April with a dozen feet of snow on the ground. There are ski areas that can stay open through April and even into May as temperatures rise to short-sleeve levels. The source of all this snow is a fortuitous combination of location, weather and topography. The Sea of Japan stays relatively warm through the winter; cold winds come down from Siberia, pick up the moisture from the ocean and hit the front-line mountains along the coast. Forced up by the mountains, the winds begin to drop that moisture as heavy snowfall, and Niigata Prefecture is right in the middle of it. 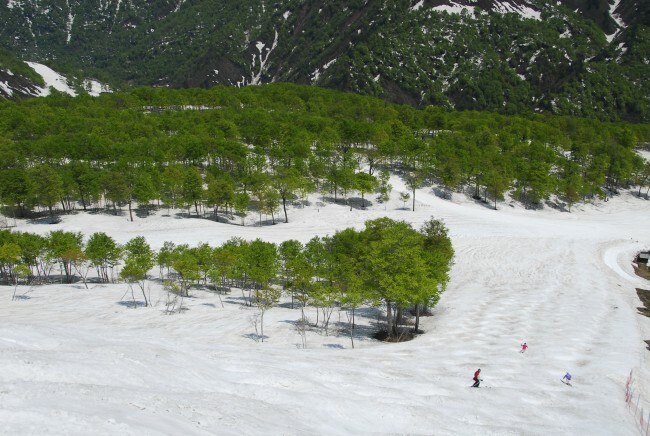 The resorts on Japan’s northern island of Hokkaido might be more internationally famous due to their incredibly light powder snow, but Niigata resorts tend to be higher in altitude and often have more snowfall overall - meaning even better conditions for a very long spring ski season. 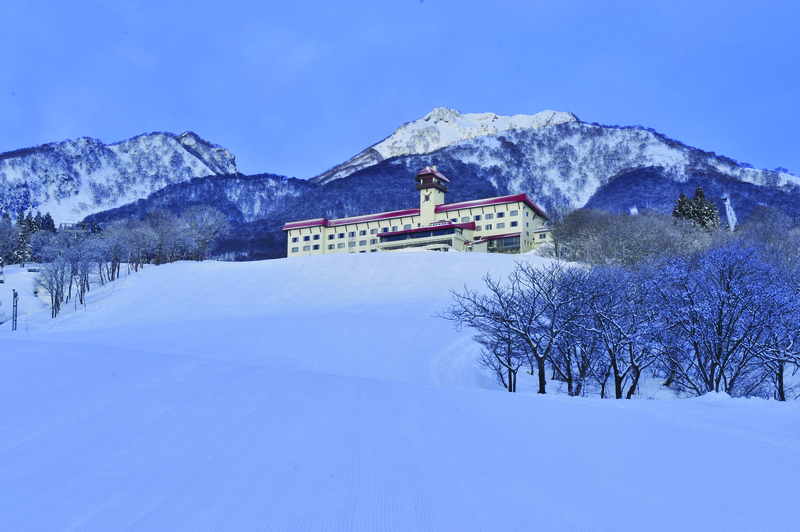 Akakura Kanko Resort & Spa is one of several Niigata resorts that keep a number of lifts operating all the way up to Japan's national Golden Week holiday at the beginning of May. One of the oldest ski areas in Japan, Akakura was created in 1937 along with the establishment of the Akakura Kanko Hotel, a beautiful structure set right in the middle of the slopes. True to the name, the hotel offers two different mineral hot springs, or onsen, on-site, in addition to the various other onsen that can be found in the area around the resort. 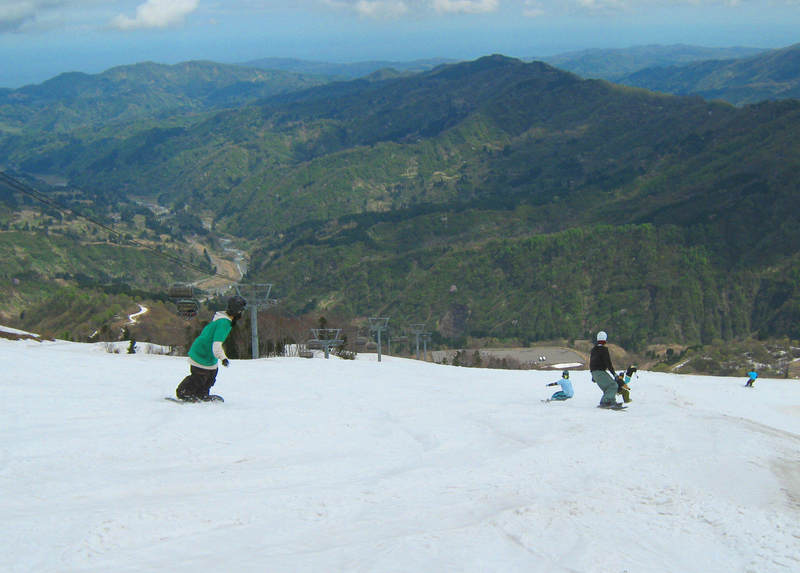 Just to the northwest of Akakura, toward the city of Itoigawa, lies Charmant Hiuchi Snow Resort. It's located high above the ocean, with views of rugged Mount Gongen to the northwest and the unspoiled beauty of Mount Hiuchi and Mount Yakiyama visible to the south from the peak. 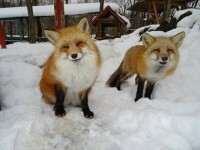 Snow permitting, the resort stays open until early May. 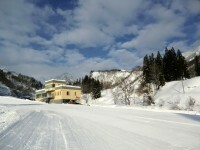 Echigo-Yuzawa was the setting of Nobel Prize winner Yasunari Kawabata's Snow Country. 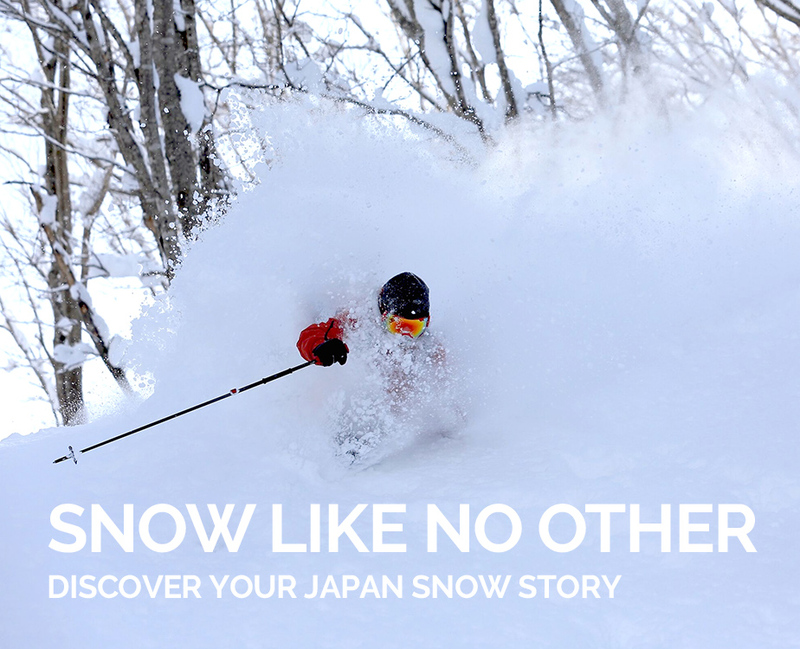 It's easy to see why: located right on the Joetsu Shinkansen bullet train line from Tokyo to Niigata, the area is home to a number of ski resorts set on high peaks that hold volumes of snow until late spring. 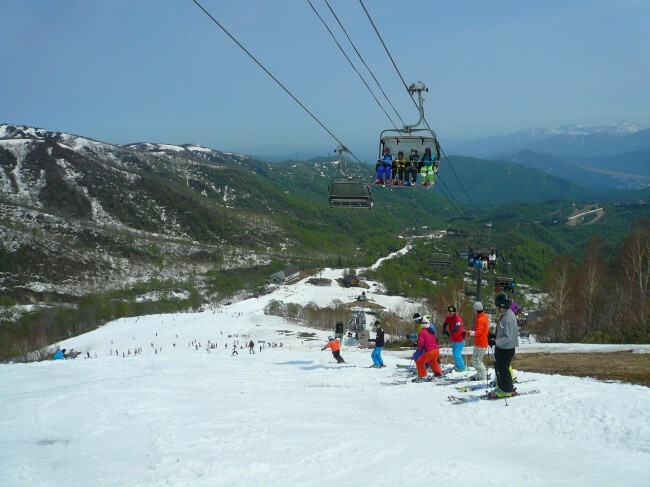 Kagura Ski Resort, part of the huge Mount Naeba ski area is usually open until late May on its Mitsumata side, and early May on the Tashiro side. The main Naeba Ski Resort open until late April. Gala Yuzawa however a resort with a gondola that launches directly from the Shinkansen station of the same name is open until May. 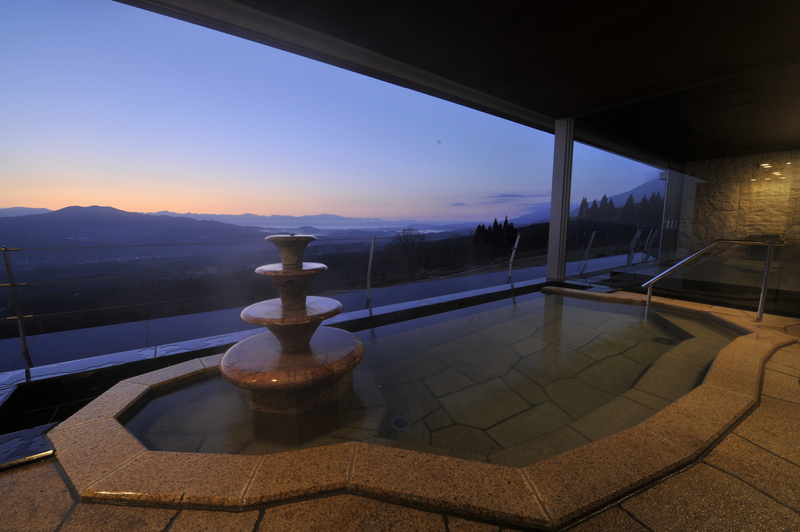 In addition to its snow, the region has an 800-year reputation for onsen, with countless places for enjoying natural, geothermally heated, mineral-rich water close at hand. Finally, if there was any doubt about really how much snow falls in this part of the world, consider Okutadami Maruyama ski resort in Uonuma City. 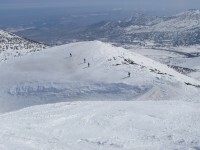 Because of the area's heavy snow, the resort may close from mid-January to mid-March, at which point the snowpack gets controllable again, allowing the mountain to stay open until May.